June 12, 1973 - The mystical happenings to Sr. Agnes Sasagawa in Akita Japan began when Sr. Agnes saw brilliant mysterious rays emanate suddenly from the Tabernacle. The same thing happened on each of the two days that followed. four occasions, this act of blood flow repeated itself. The wound in the statue's hand remained until September 29, when it disappeared. On September 29, the day the wound on the statue disappeared, the sisters noticed the statue had now begun to "sweat", especially on the forehead and neck. August 3, 1973 - Sr. Agnes received a second message. October 13, 1973 - Sr. Agnes received a third message. 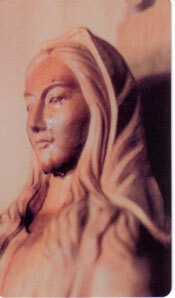 January 4, 1975 - the statue of the Blessed Virgin began to weep. It continued to weep at intervals for the next 6 years and eight months. It wept on 101 occasions. "There is meaning to the figure one hundred and one. This signifies that sin came into the world by a woman and it is also by a woman that salvation came to the world. The "zero" between the two signifies the Eternal God who is from all eternity until eternity. The first "one" represents Eve and the last "one" the Virgin Mary." for the glory of the Father and the salvation of souls." Divine Son. Please defend and protect me as Your Special Child. asked that you pray with fervor." Lord, listen to what I have to say to you." their poverty for the sinners and ingrates." beloved souls who console Him forming a cohort of victim souls. ingratitude and outrages of so many men. to capacity and position, to offer herself entirely to the Lord." who wish to pray are on the way to being gathered together. fervent in prayer to console the Master." understand you and to direct you." remain for you will be the Rosary and the Sign left by My Son. for the Pope, the bishops and priests." no longer pardon for them"
one sent to you and your superior." their confidence in me will be saved." 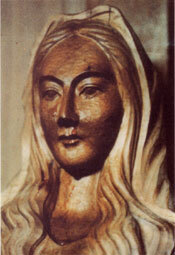 veneration of the Holy Mother of Akita. 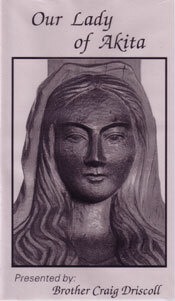 has received messages from Our Lady. the Akita events and messages as reliable and worthy of belief. 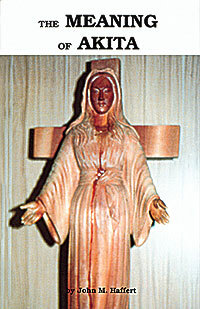 Tells of the occurrence of the bleeding and tears from a statue of the Virgin Mary along with a voice above the crowd in Akita, Japan. Also tells the 400-year-old story of Japan's Christian past. 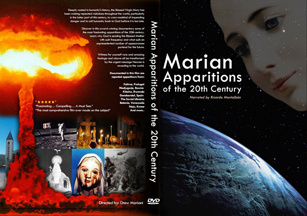 This is the best source book on the most important apparition since Fatima. After translating it into English at the request of the Bishop of Akita, Haffert said, "The Bishop wanted this published before any other because its author was an eyewitness to the events which confirm the messages in which Our Lady describes the chastisement to come as 'worse than the deluge,' but which so far She as been able to hold back." This audio tape is a copy, with permission, and no jacket or cover is provided. 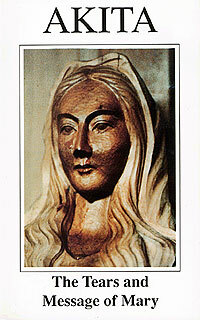 This booklet tells the story of the apparitions and weeping of the statue of Our Lady at Akita. Part of the prophecy of Akita is so terrible that even in his pastoral letter approving the apparitions, the Bishop said that it would be difficult to believe were it not for the miracles, including those of Our Lady's tears. But what do they mean? 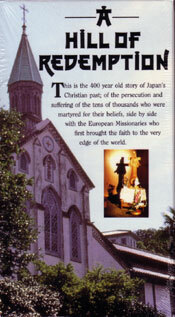 The Bishop of Akita himself said of this amazing book, "I recommend it and testify that its contents are true." Neither Pope John XXIII nor Pope Paul VI, considered it advisable to reveal to the world the third part of the secret of Fatima. However it is certain that the third part of the Secret is of particular gravity. Have we reached a fullness of times? Are we living the beginning of the Apocalypse prophesied by St. John? The time has come when words are not enough anymore. It is now necessary to act immediately if we wish that humanity, that each of us, may be able to see, beside the fire, the light. I was stunned. Why was the authoritative and conservative Radio Vatican referring to fire and apocalyptic times? I sensed the Holy See was issuing a wake-up call. This is what I believe: Mary's rightful place beside Jesus needs to be established to prepare for the fulfillment of a promise made by Our Lady at Fatima, which was the conversion of Russia and a time of world peace. It is the long awaited Triumph of Her Immaculate Heart promised at Fatima that will bring peace to all nations. The entire Catholic world, led by the Holy Father, is anticipating and yearning for this victory. Tied together with this victory are three messages of the twentieth century--Fatima, Amsterdam, and Akita--guiding the destiny of mankind in the new millennium. Fatima occurred in 1917. Twenty-eight (28) years after Fatima, in 1945, Our Lady of All Nations came to Amsterdam. After another 28 years, She manifested Herself in Akita, Japan. Another 28 years will bring us to the first year of the third millennium, 2001. Bishop John Ito, Ordinary of Akita who approved the apparitions, wrote to me after he briefed the Holy Father about the Akita events and presented his pastoral to Cardinal Joseph Ratzinger for approval. 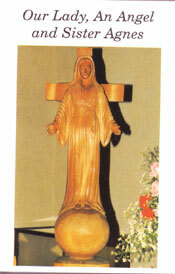 Bishop Ito was certain that Akita was an extension of Fatima. And Cardinal Ratzinger personally confirmed to me that these two messages, of Fatima and Akita, are essentially the same. The time has come when words are not enough anymore. It is now necessary to act immediately if we wish that humanity, that each of us, may be able to see, besides the fire, the light. Two thousand years ago the Holy Spirit came upon Mary, and when the power of the Most High overshadowed Her, She conceived Jesus, Son of God. Now it is the Mother of all Nations, the Coredemprix, Mediatrix of all Grace and Advocate, who will accompany Her Spouse to descend into our hearts and souls and recreate in each of us--if we give our fiat--the likeness of Jesus. United with the Hearts of Jesus and Mary, in Their passion for the Father's Will, with the fire of the Holy Spirit blazing in us, we can dispel the darkness that shrouds the world and renew the face of the earth. Tremendous new video. 30 minutes of the most exciting and fast moving spiritual video ever produced! You will want to show this inspiring information to everyone that visits your home! Throughout history, humanity has witnessed statues and icons weeping tears. What do they mean, and why are they occurring today in record numbers? Why does Heaven cry? In this exciting documentary, you will travel the planet and witness for yourself actual footage of this unexplained phenomenon-a phenomenon that baffles scientists and defies the laws of nature. Discover what these tears are revealing to humanity and decide for yourself how important these tears of love are for you and for the entire world. John 7:17. If any man will do the will of him, he shall know of the doctrine, whether it be of God, or whether I speak of myself.